The cucumber has become a mainstay of the British salad, and in fact what could be more English or refined than a freshly cut cucumber sandwich? Of course, should you require a cucumber you can easily pop down to your local supermarket and purchase an extremely straight looking, poorly flavoured, and watery specimen. But if you want something that has a decent meaty texture and 'God forbid' some flavour them you cannot do better than grow your own. And there you will have a choice. You can grow traditional cucumber crops in a greenhouse or - and this is true for those growing in a northern European climate - you can produce some hardy, stubby cucumber varieties outside. 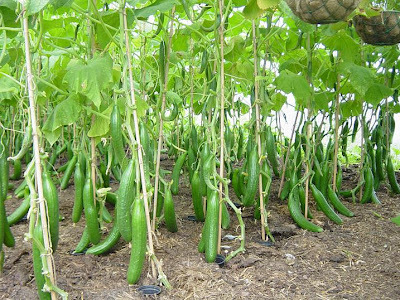 When growing cucumbers it is essential to keep them well watered to help your plants establish and to increase crop yields. Feed your cucumber plants with a high potash feed every two weeks once the fruits begin to develop. 1. Keep the greenhouse warm and humid by regularly spraying or damping down of pathways. You will probably need to apply some greenhouse shading to protect the plants from scorching. 2. Trailing types will produce higher yields if made to climb. Train the main shoots onto 1.8m (6ft) canes or strings until they reach the top of their support and then pinch out the growing point at the top of the plant. Once the fruit begins to develop, pinch out the end of each side shoot, leaving two leaves after each fruit. This helps to encourage more side-shoots which will produce bigger crops of cucumbers. 3. Always remove the male flowers from greenhouse cucumbers. Female cucumber flowers can be identified by a swollen bulge between the bottom of the flower and the flower stem that looks like a tiny cucumber. Male flowers just have a plain stalk so you can easily tell them apart. 1. 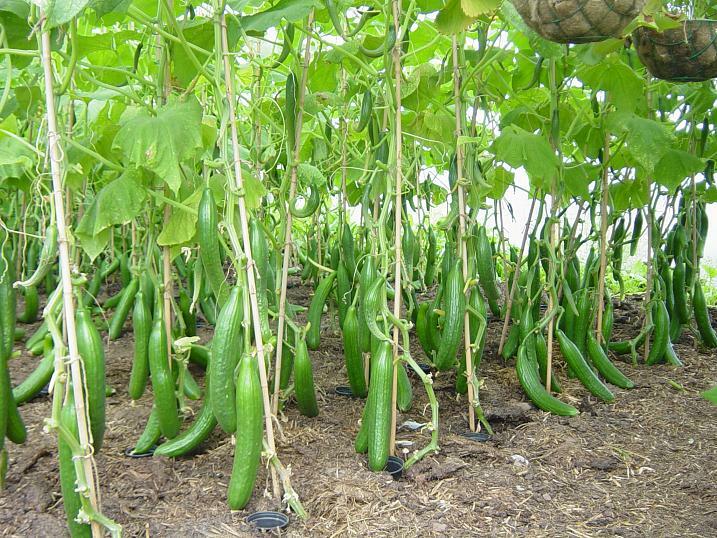 Cucumbers growing outdoors will not need training onto canes - just let them sprawl across the ground. 2. Ridge cucumbers can be pinched out at the main stem after 7 leaves have formed to encourage fruiting side shoots to develop. 3. Outdoor ridge types require pollination by an insect which needs both male and female flowers to be present - do not remove the male flowers from these varieties. 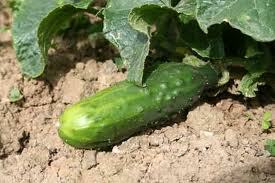 You can normally begin to harvest cucumbers around 12 weeks from sowing. Harvesting cucumbers is best done early in the morning when temperatures remain cool. Cut the fruits from the plant using secateurs or a sharp knife. 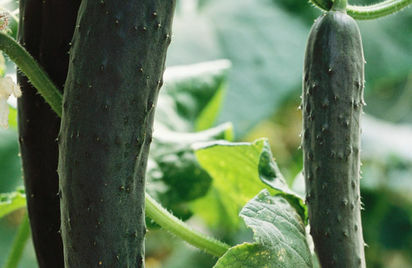 It’s best to harvest cucumbers while they are young and tender, before they show signs of producing seeds, as older fruits can become bitter. Regular harvesting will encourage long continuous production - outdoor types can continue to fruit until September, while greenhouse types can fruit into October if temperatures are warm enough.